In one of her many live banters with her co-hosts Toni Gonzaga and Boy Abunda during The Buzz’s June 15 episode, Kris Aquino frankly shared that in reference to the box-office film, there will be no “Starting Over Again” between her and ex-husband James Yap. The reason, according to Kris, is because the San Mig Coffee Mixer star player is very happy with his relationship with Italian girlfriend Michela Cazzola. “No, no. He’s happy with his girlfriend and she’s a nice person and they deserve happiness,” she said. 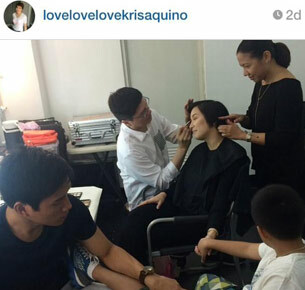 But the most important thing for the Kris TV host is how Michela treats Bimby, her only son with James. “She’s nice to Bimb ‘yun ang pinakaimportante. Basta mabait kay Bimb okay sakin,” Kris emphasized. Kris explained that it’s very crucial for her to see that Bimby has a good relationship with Michela simply because he would always be James’ son. “Kasi they’re gonna have a relationship for as long as that relationship lasts, umabot sa kasalan at magkaroon sila ng mga anak, Bimb would always have a relationship with them,” said Kris. Reports have it that Michela first met Bimby last April 6 the exhibition match of PBA All Stars and Gilas Pilipinas. The couple have been together for a year now following James revelation of their relationship June last year. Questions about Kris and James supposed “new beginning” was spurred by the latter’s revelation that she was with the former on Friday. “So dumaan si James sa pictorial may dala siyang… parang chocolate mousse tapos may dala siyang cupcakes for me,” the Aquino & Abunda Tonight host claimed. This anecdote of her was actually something that was backed by a post on her Instagram account which featured her, James and Bimby seemingly chilling. “Cool lang kaming lahat. Advanced Happy Father's Day James,” the photo’s caption read.